I'm not going to give an in depth review because to be fair, it's very hard to rate a book when you read it a chapter at a time.What I should have done is put the book down and come back to it later when I was in the mood to read some epic fantasy. I already know my reading moods and I know when I'm in the mood to read EF, and when I'm not. Still...something made me keep reading because I knew that the book was going to be good. And it was.But, because I didn't sit down and read it through like I usually do with most books, it became harder to "love" it. Most of the book was good but not grabbing me until the very end. I really wanted to see more action earlier on in the book. My attention span as of lately has been shot, so slow world building just doesn't do it for me the way it might have a few years ago. However, the last few chapters were exciting and had me in rapture. 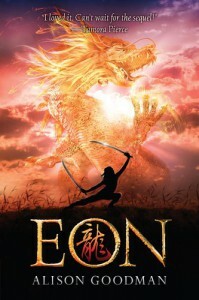 Something about finally getting to see Eon become Eona changed my feelings toward the book. I may not be in a hurry to pick up Eona, but I definitely plan on it at some point.